taurus rising: rhubarb and a chive update! 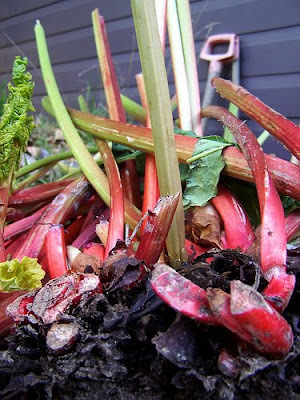 my new rhubarb plants are in. Im hoping for a big, bright, showy display right next to the studio. 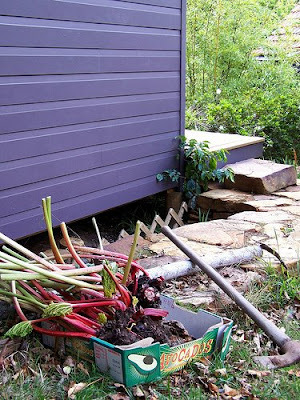 I put the rhizomes down to get a spade and noticed the amazing contrast of the red with with the purple wall. Home found. Decision made. New bed required. So the Bloke made a lush new bed from some great compost right in that space that needed filling. 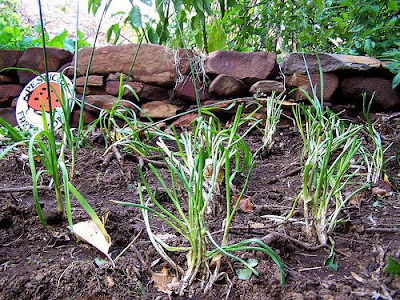 And Ive put to rest my obsession with planting chives from seeds and, courtesy of the generous donations of Veggie Gnome (garlic) and Olive (regular), am now the very happy owner of a chive plantation! May they thrive for me as they did for them. 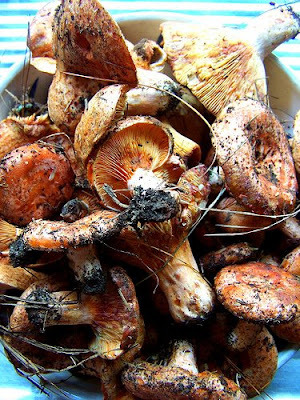 And just coz i can, here's yesterdays mushroom haul; nearly 2kgs and tonights dinner. God, i could have kept picking them for hours except that just would have been uber greedy. A good brush off and some pasta is all thats required. Hi Kel, what variety of rhubarb have you got? the big one!? umm, Veggie will have to answer that! don't know your email addy, but hopefully I'm in time to give you the recipe. Stewart, I have no idea. I 'rescued' a puny crown from our backyard where it got mown down all the time. In the current location - with tons of compost and manure - it grows like mad. It needed dividing (again!) and this was a great opportunity to do so. Kel, I am really, really envious about your haul! I can just smell those little buggers freshly picked. Earthy, foresty. AND I can smell them as they are getting cooked. I will have to get that fungi book and go mushrooming in the forest. Any chance of a smallish corm making it up my way. The stems look so lovely and red and inviting. Very nice indeed Kel. I am thinking that the chives and mushrooms are worth the 789km trip alone. lol at the book you are reading! Amazing! Is it any good? Stewart, I think there might be a smallish corm left over. I'm sure it would be quite happy to make your garden its home. Kel, where are the taste reports and pictures of that feast? Next week will be perfect for mushrooming. Forecast is for sunny days. After all this rain there should be quite a haul. pip- thanks so much for the recipe, we had it on egg pasta and it was delicious. B1 said best ever musromm sauce she'd had! Thanks for B'Day wishes, i had a great day. stewart ( and veggie) glad youre chatting amongst yourselves! brilliant. we'll co-ord a plan. gav- reckon you might find some a little closer, but tis a lovely community we have going here..plenty of room! annuska- brilliant huh? its good so far, havent had much of a chance to read! veggie- i shall pick you some as we are planning a weekend visit!!! while theyre up...by birthday night was such a rush with friends coming to stay and leaving early the next day the pasta and tarte tartin made by simon got gobbled before a pic could be taken. first double dish meal hes done. it was fab!